Another recent Gallup survey completes and confirms what we already know from the other Gallup survey and other research. 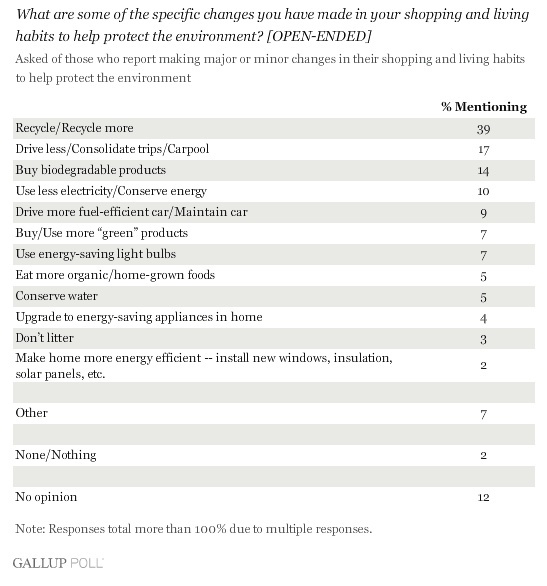 There is a core group of people, about 30% who are deeply committed to making environmental changes. As Kyle emphasized in one of his earlier comments here, these are the people we need to work with. They can be evangelists for sustainable living. Recycling comes out on top, again. Probably the only green habit that is supported with widespread infrastructure and easy, no cost solutions. Let us take note and imagine how the same can be done in the other areas. 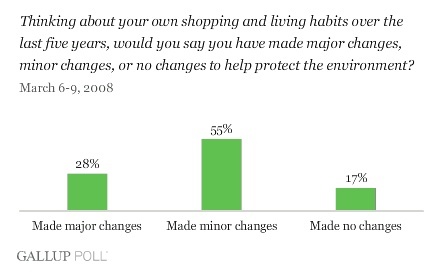 Last, this particular survey gets into demographics, and confirms prior research. Women are leading the way of the green revolution, and so are the people with more democrat leanings. Mary and Diane, the women part should please you! I don’t know about you, but this leaves me with a sense of increased clarity, and hope for what can and needs to be done next. I just watched two short video clips of a recent talk from Al Gore at the American School in London. Very inspiring . . . This is where a national advertising campaign with a thousand black balloons could help us remember. A while back, I shared a drawing of myself exposing the disconnect I felt between my head and my heart. I love how Al Gore flips that problem around and turns it into an opportunity. Continuing our thread of conversations on climate fight messaging, I would like to spend some time discussing possible targeting strategies. While it is true that global warming is a problem that concerns us all, in the interest of efficiency, it makes senses to go after those groups of people who are most likely to be persuaded positively. If we were to use a traditional ‘shades of green‘ segmentation model, the obvious choice would be to go after people who are on the fence, not the minority of green enthusiasts – people like you and me -, not the uninterested, but the people who see global warming as an issue, and who need to be pushed into action. While being the correct target, it leaves us with not enough to go by in terms of executing a campaign. A more interesting strategy, in my opinion, uses a combination of psychographic and demographic descriptors to identify high potential targets. I got the idea of considering demographic segments, from Mary Hunt. Mary has chosen to focus her efforts on women, the ones in the household who are responsible for 80% of the buying. Makes sense doesn’t it, when like Mary, you are trying to educate the public about sustainable standards for high ticket, high environmental impact items such as flooring and furniture? Of equal importance is the need to communicate with people on an emotional level. The global warming message has made it into people’s heads, but has failed to grab them by the heart. Appeals to morality and civic environmental duty can only go so far. People have to feel moved into action. So many ways to slice the pie . . . Which of these people would you be most willing to bet on? Directly, the more information a person has about global warming, the less responsible he or she feel for it; and indirectly, the more information a person has about global warming, the less concerned he or she is for it. Results of the whole study appear in the February issue of Risk Analysis. John Tierney joins the chorus of people in the research: ‘I think it’s (global warming) a real risk, but I’m also confident that we’ll cope by adapting to climate change and/or finding ways to minimize it. I disagree with John Tierney, and unlike him, am not so sure that ‘we’ll cope‘. It is going to take more than technology and science to come even close to a happy resolution. Leadership at the top, business solutions, technology and science yes, financial incentives, individual behavioral changes, community initiatives, a new code of ethics, international diplomacy, population control measures, lots of goodwill at all levels, . . . the problem needs to be attacked from all possible angles. It is monumental in proportions and requires solutions of the same magnitude. It should be noted that the information effects reported in this article are limited to self-reported information. Objective measures of informedness about global warming and climate change might produce different effects. And indeed there is some scholarly evidence to suggest that this might be the case. In their models of mass assessments of the risks of genetically modified foods, Durant and Legge found that self-reported informedness and objective measures of informedness were almost entirely uncorrelated, and that their effects worked in opposite directions. I have noticed an interesting phenomenon over the last few days. My once electric enthusiasm for Barack Obama is waning. Gone the frequent visits to the Huffington Post. Gone, the comments left on any post even remotely connected with my man. Gone, the daily check ins with local headquarters. I am suffering from Obama fatigue. I will answer to MoveOn‘s one click calls to petition the Super Delegates, or their Facebook plea for $2.30. That I can do, will do, still. More, I am just too burnt out. Even the ‘movement‘ cannot carry me on. The same fatigue factor applies to the climate fight as well. How does one get people interested and engaged, without running the risk of losing them down the road? This is a big problem, particularly with influencers, and people with the most power to impact outcomes. Any ideas?